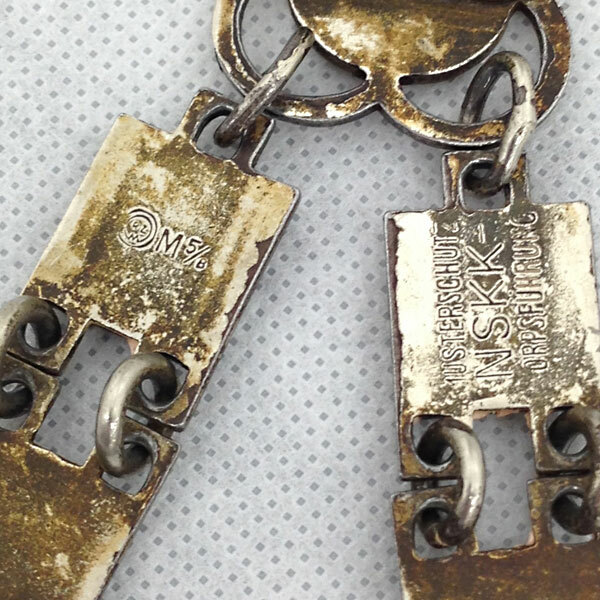 The photos tell the story with this one. 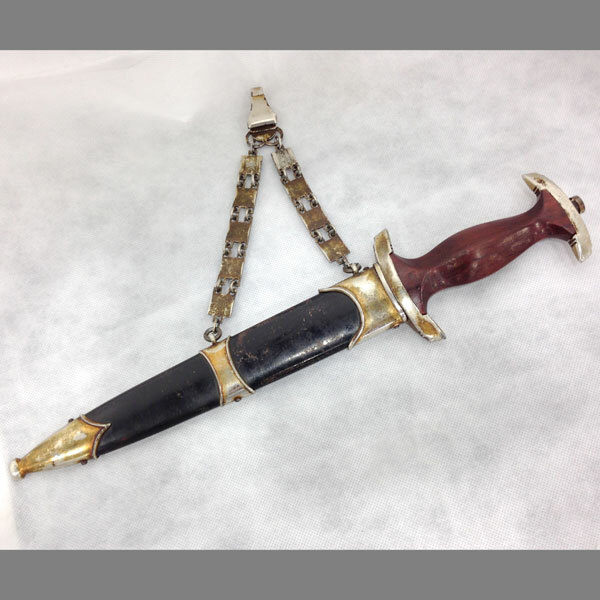 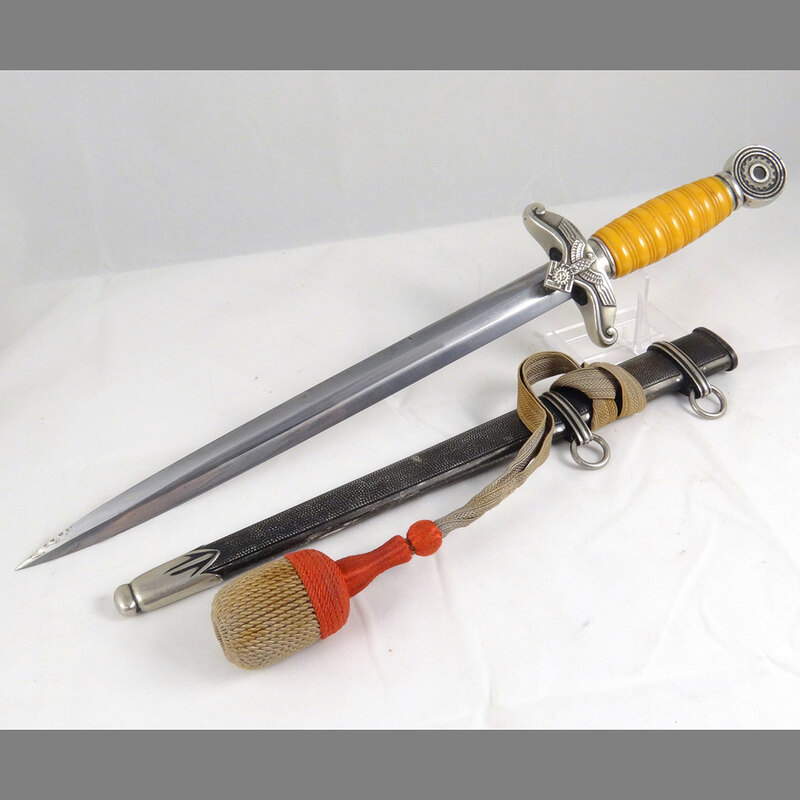 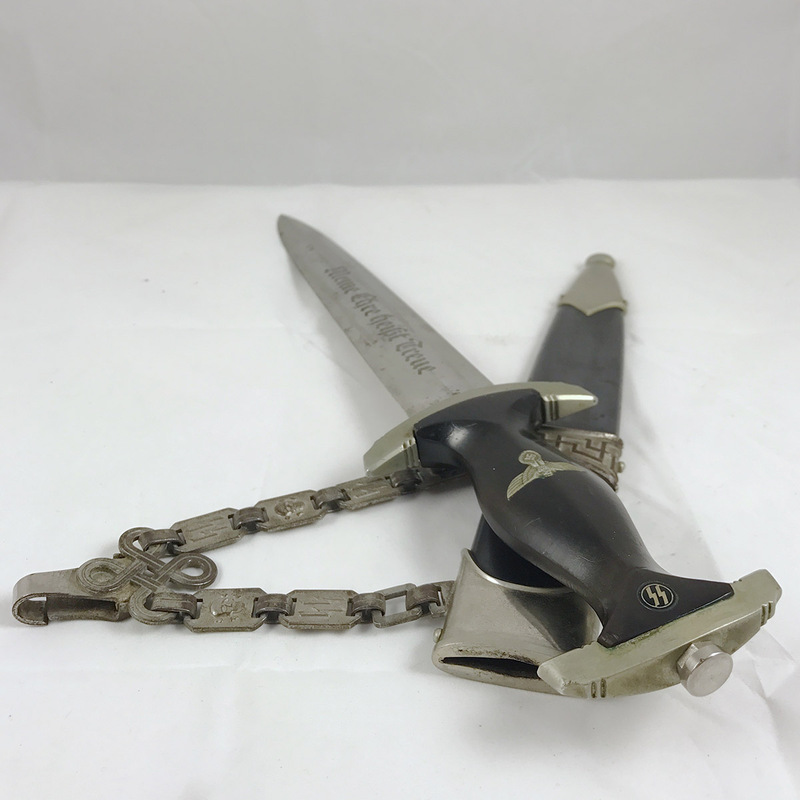 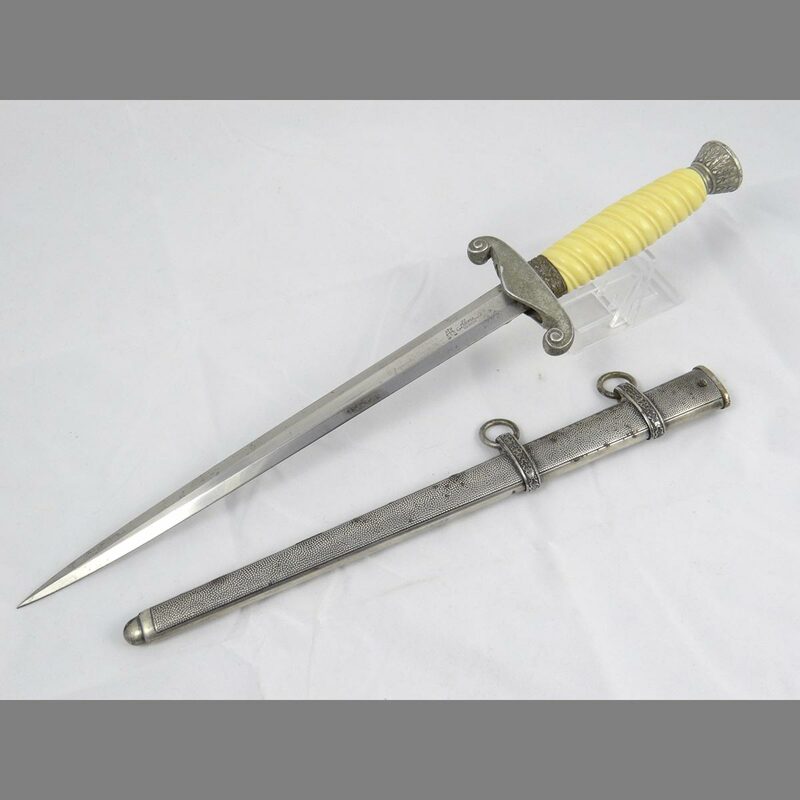 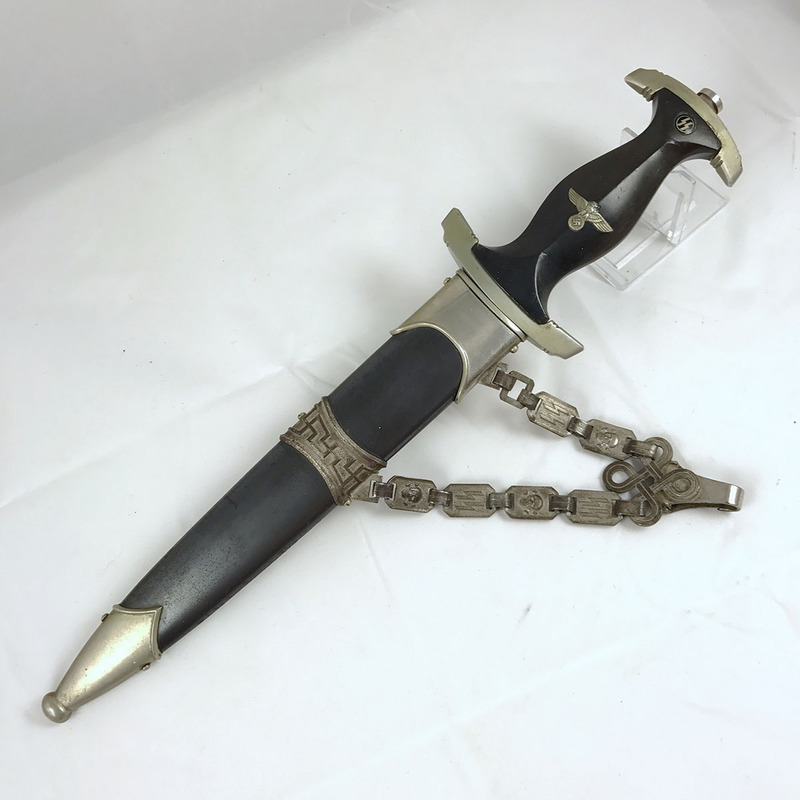 An Chained NSKK Marine Dagger by Carl Eickhorn (M7/66), dated 1939. 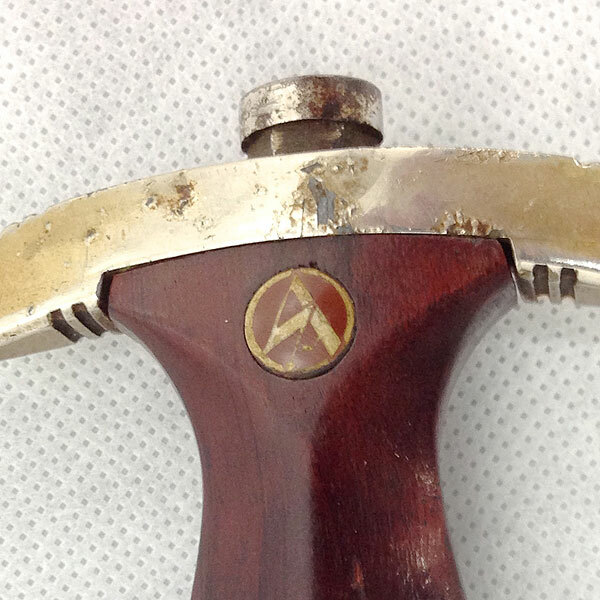 The grip has a nice original sheen finish, which emphasizes the attractive cherry wood color. 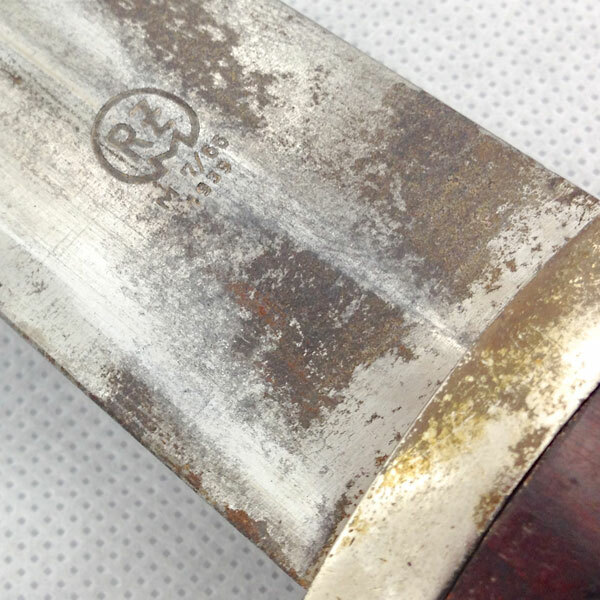 There are no cracks or chips on either side of the grip, and only a couple very minor use marks. 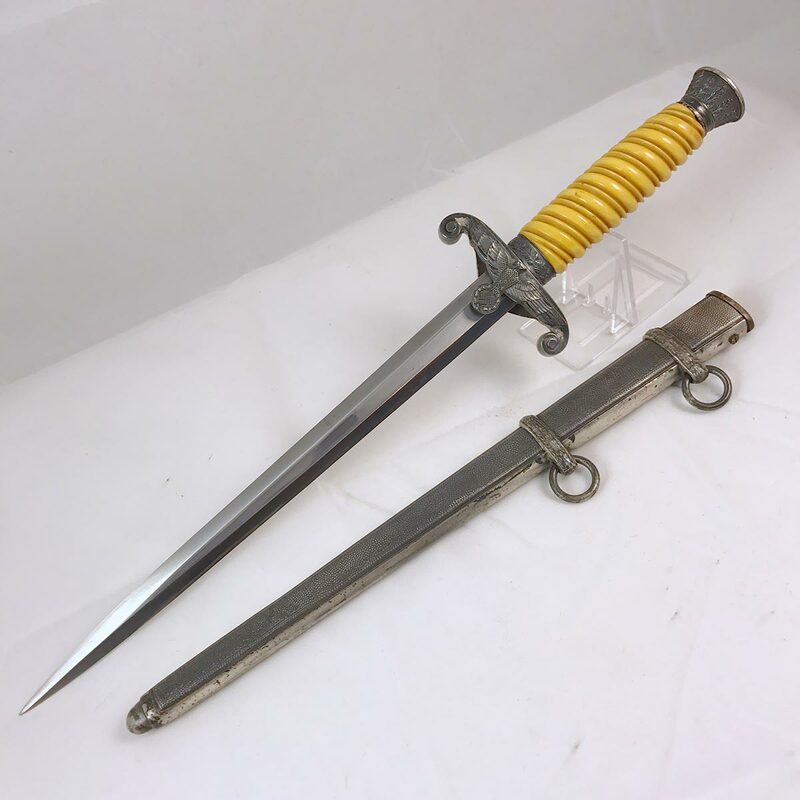 The eagle is in near perfect condition, with easily 95% – 98% of its original detail, and a nice amber accent color as expected with a Marine version of the NSKK dagger. 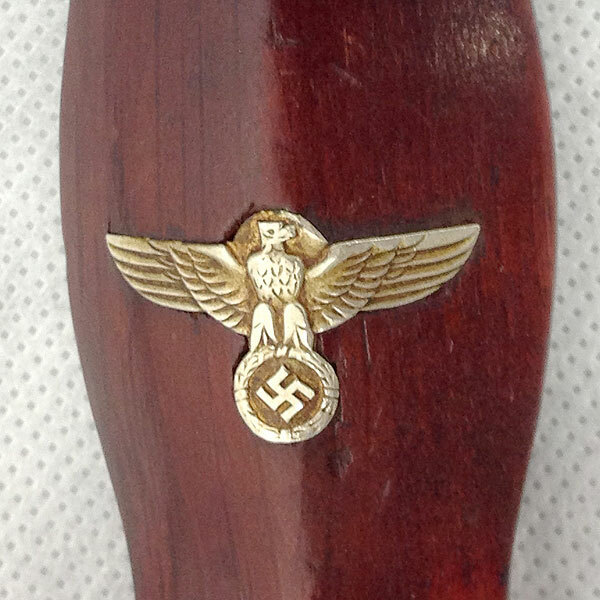 The SA roundel is a bit hazy from age, but the enamel covering appears to be 100%. 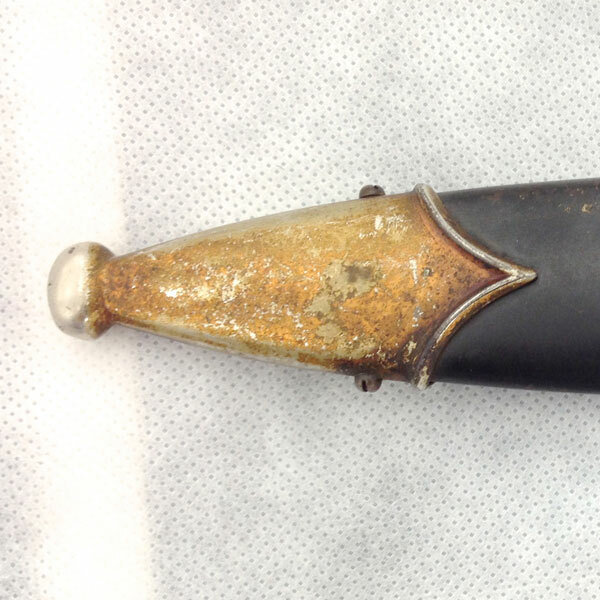 The crossguards have much of the amber (marine) tint still present, but there is some plating lifting in spots (see photos). 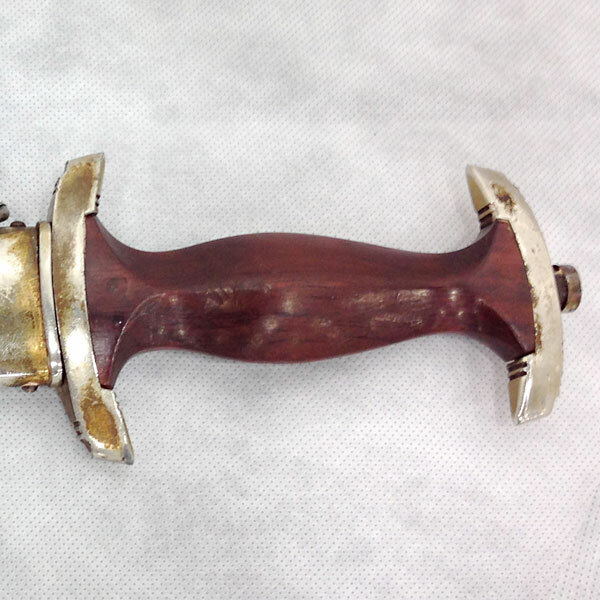 The pommel nut shows none of the gnawing we see from improper removal so we’re assuming this has never been apart. 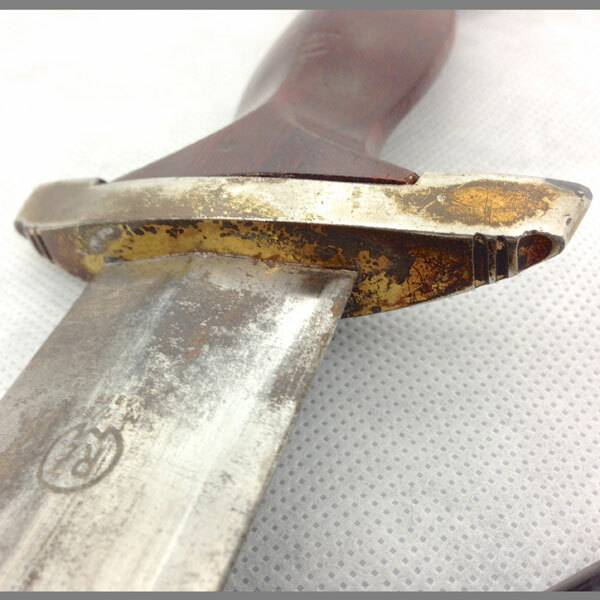 The blade condition (poor) at least supports an assumption that none of the parts have been replaced. 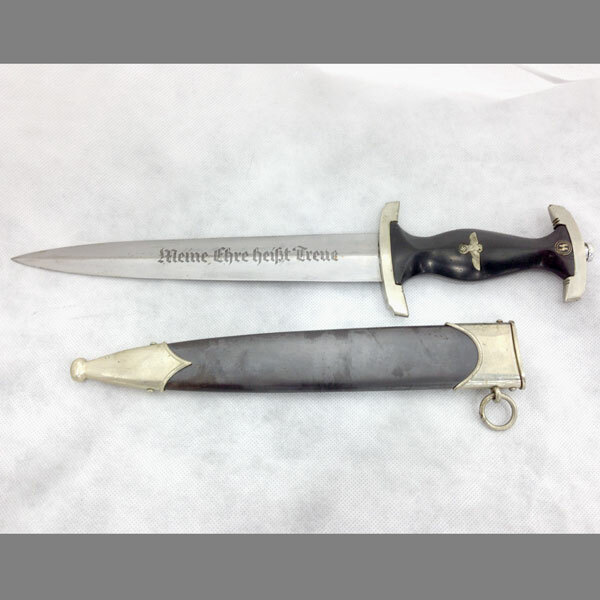 Typically the first part replaced is the blade since dagger blades tend to oxidize easily when improperly stored for long periods of time. 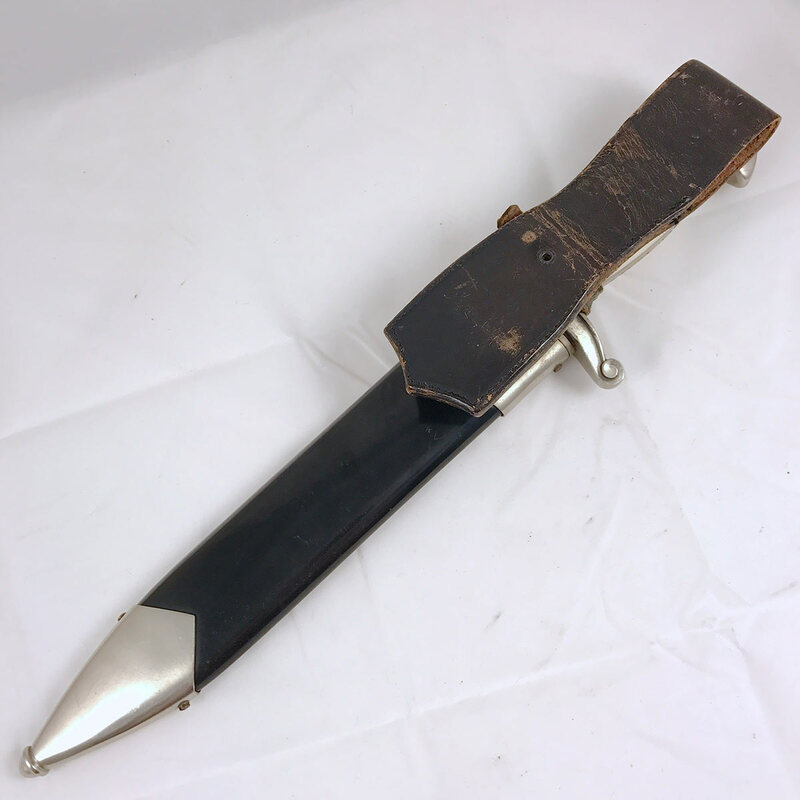 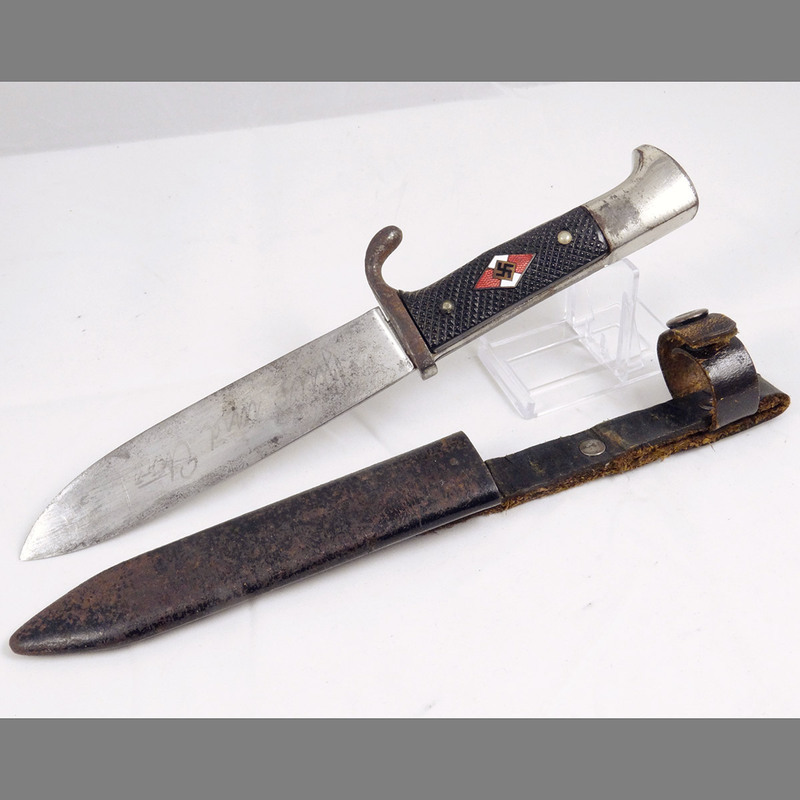 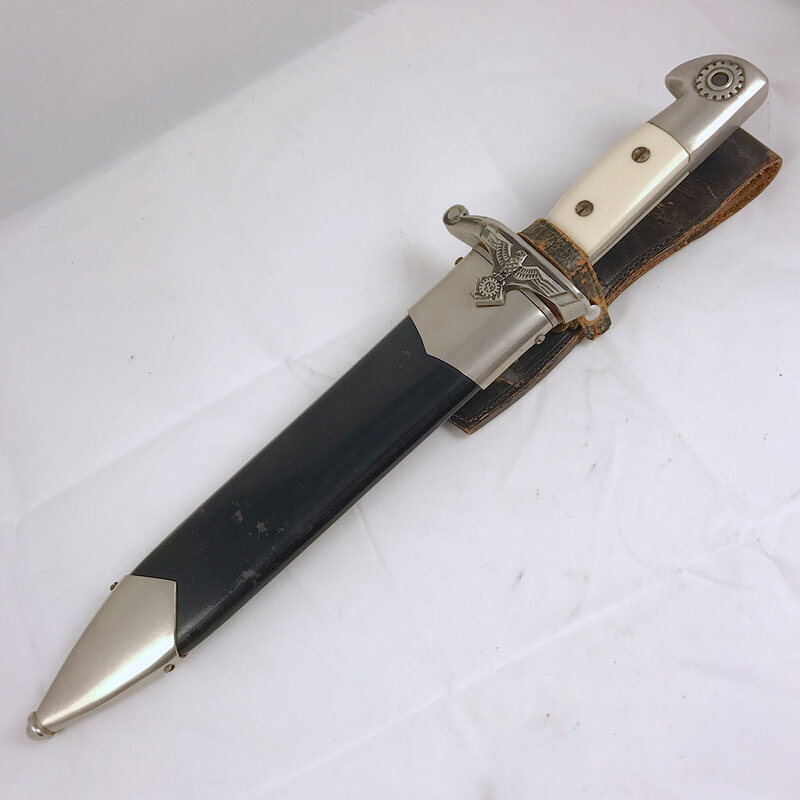 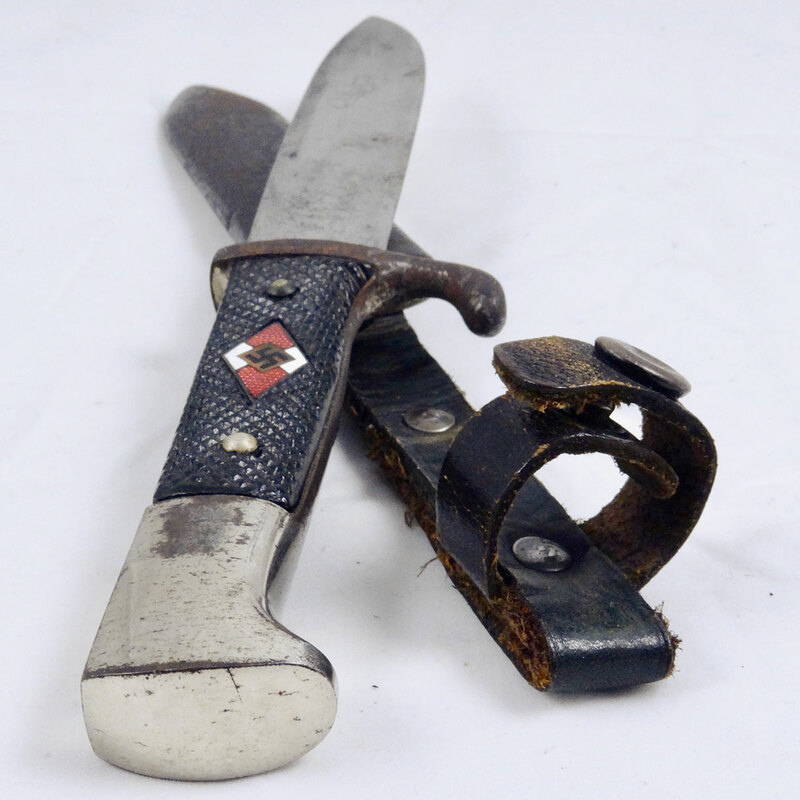 As mentioned, the RZM M7/66, 1939 marked blade’s condition is poor, but to the seasoned collector the condition of the rest of the dagger will carry its weight. 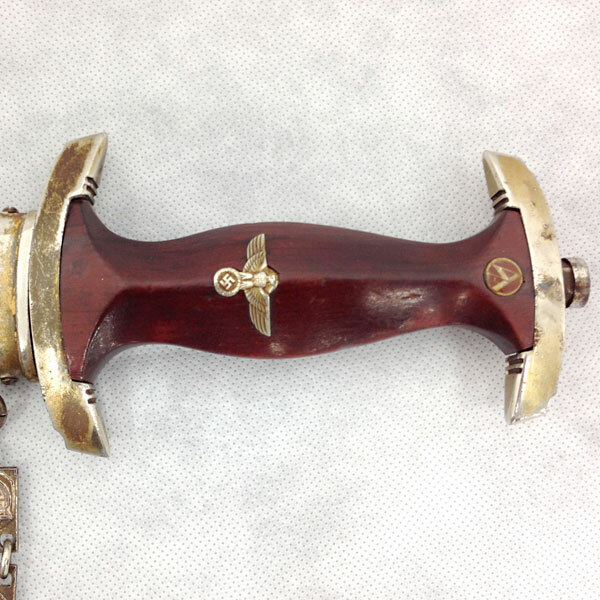 A Marine NSKK Dagger’s blade can be easily replaced since it only requires the same RZM marked blade as a standard SA or NSKK dagger by the same maker (Carl Eickhorn). 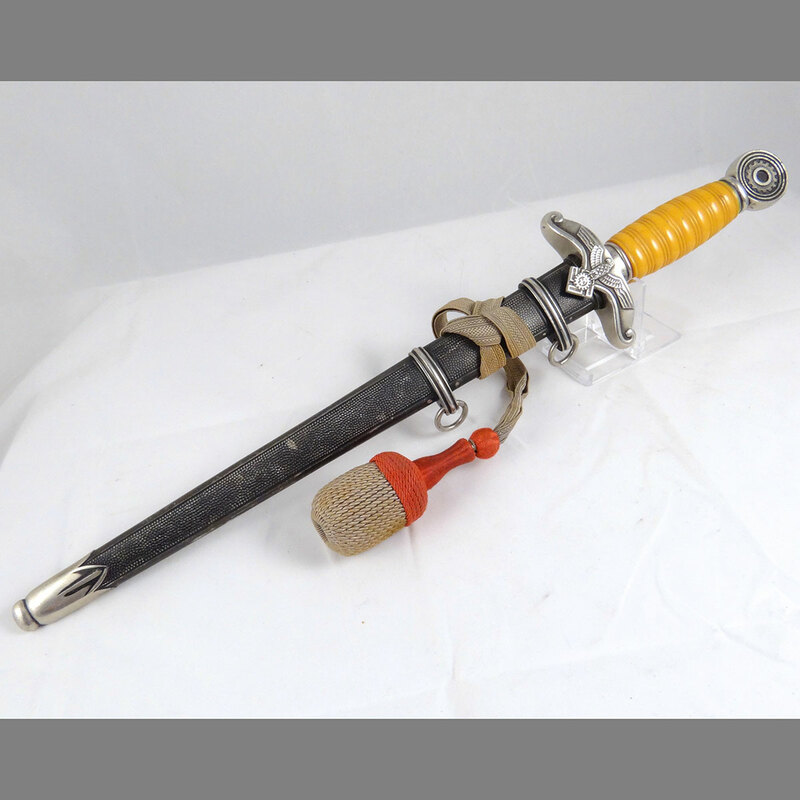 However, the other amber tinted parts, including the chain, and uniquely semi-gloss grip (with amber tinted eagle) cannot easily be replaced since they’re almost impossible to find. 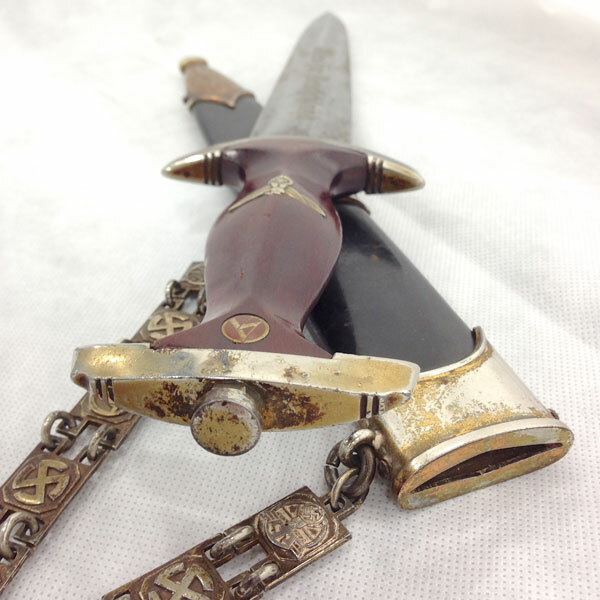 Replace the blade and you have yourself a fine, rare dagger! 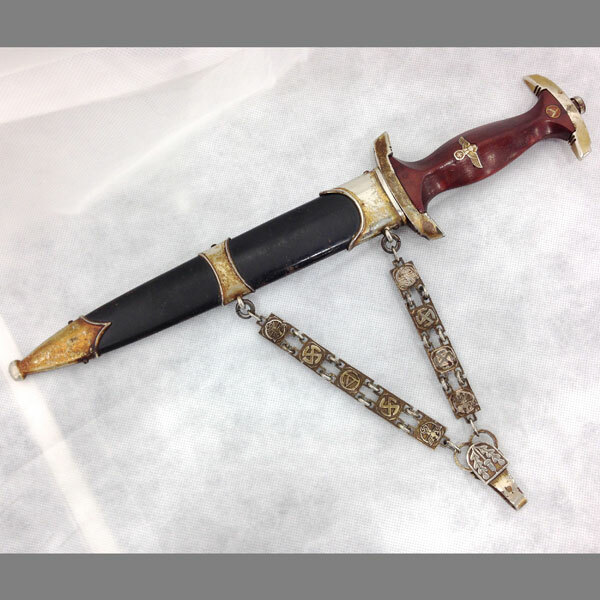 The scabbard condition is exceptional. 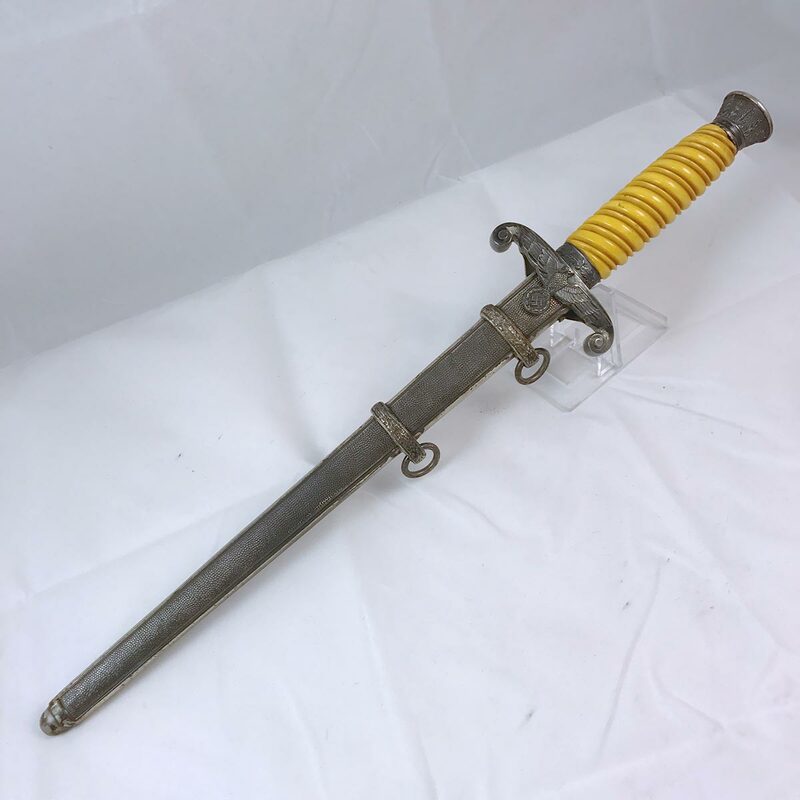 It could use a cleaning (if the buyer so chooses), but otherwise retains more than 95% of it’s original factory color; this scabbard has not been repainted. 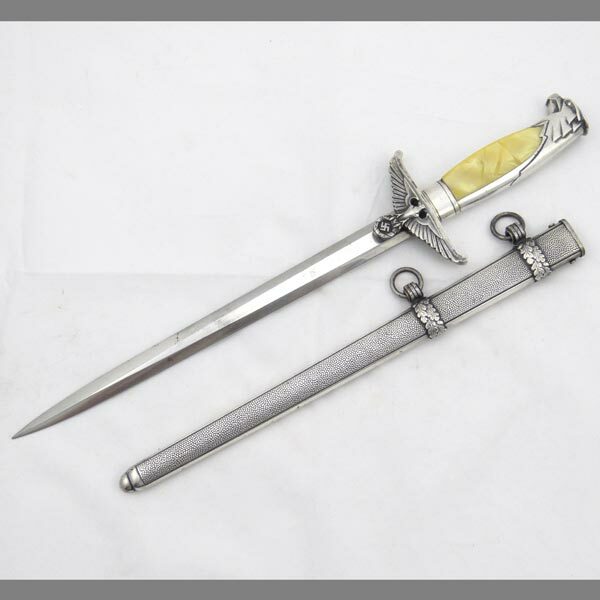 The metal fittings of the scabbard have the same amber tone as the guards and other metal parts, with the same level of wear consistent across all metal fittings. 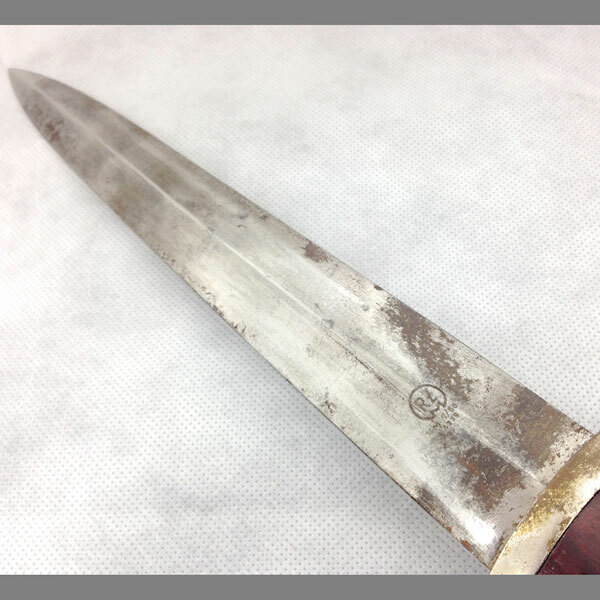 There are no notable dings, not even to the tip ball! 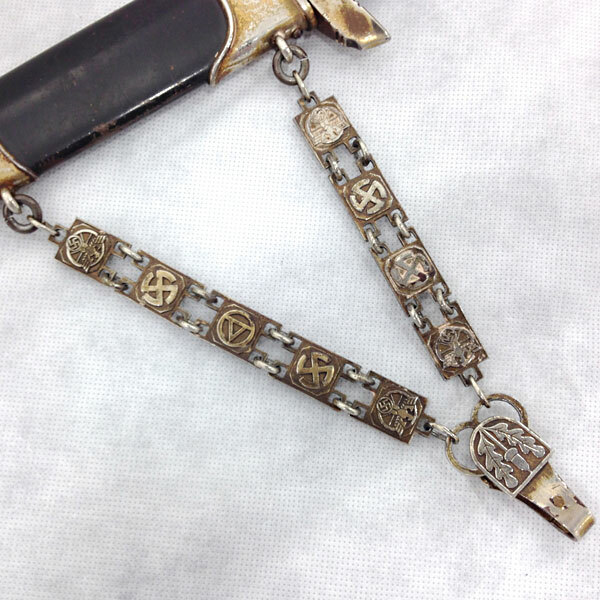 The chain is complete and 100% original (including all links). 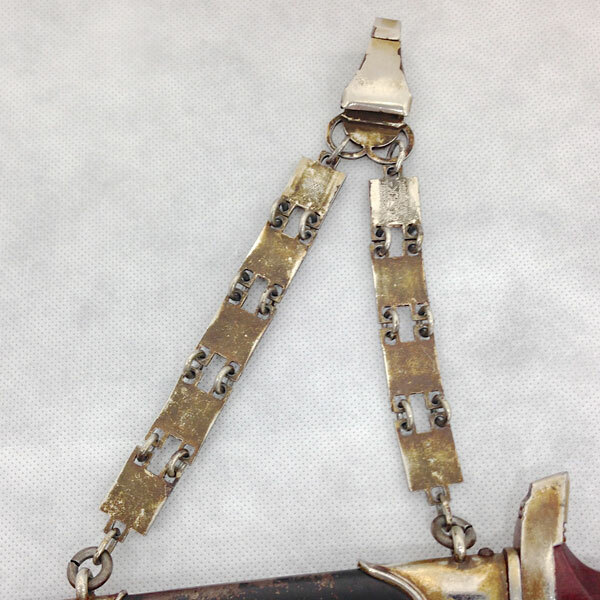 There is some plating wear, including on the clasp, but the amber tinting is present throughout areas of the chain as well. 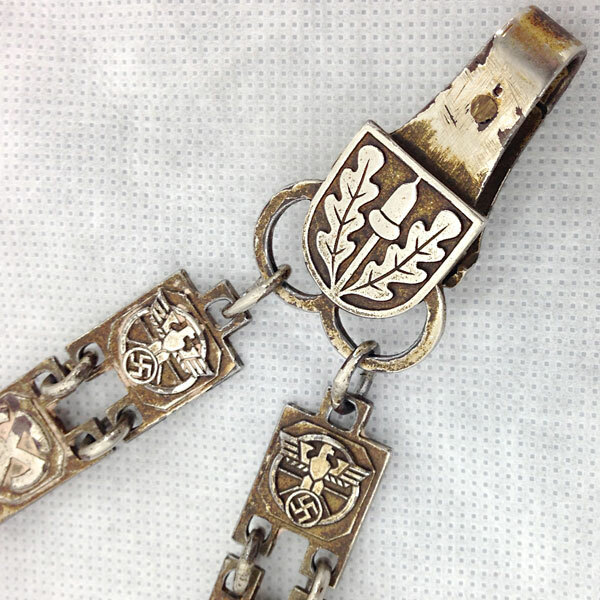 On the reverse of the two links closest the clasp we see the stamps “RZM M5/8” on one link, and “Musterschutz NSKK- Korpsfürung” on the other. 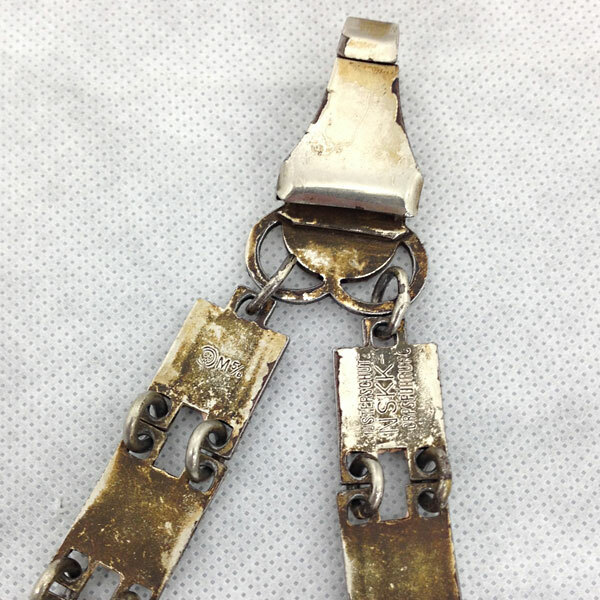 The clasp itself is still functional and closes firmly as expected. 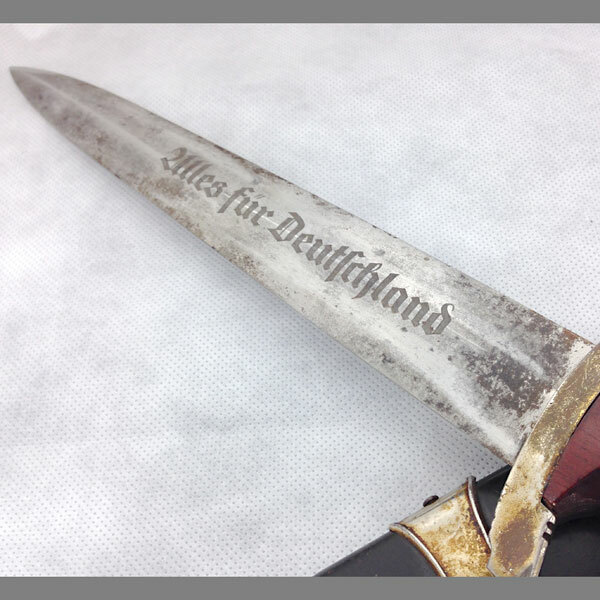 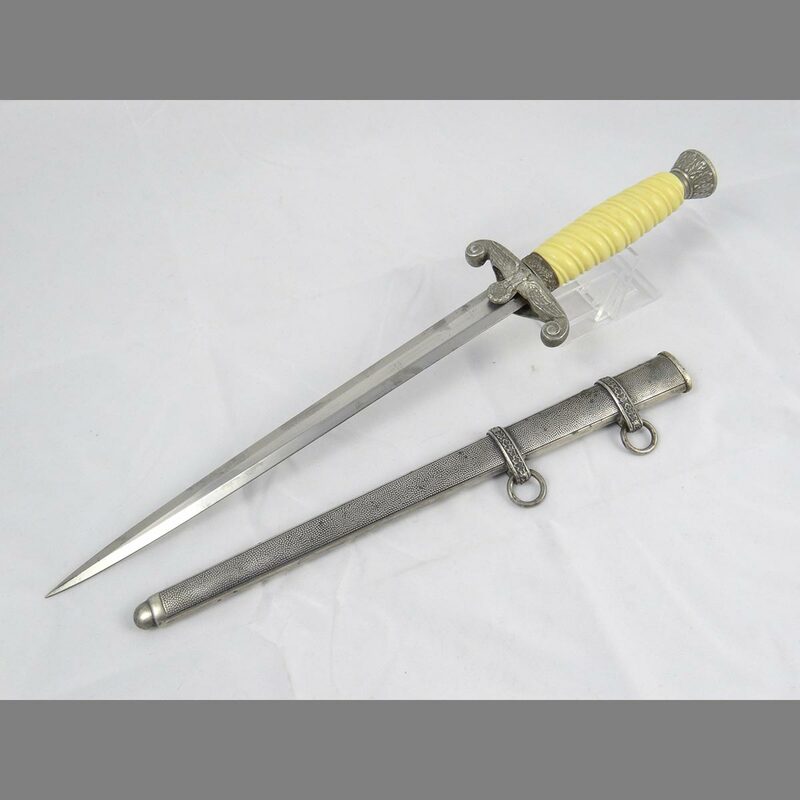 Overall, despite the blade condition, this dagger is solid and would make a very nice, and very rare addition to any German Dagger collection.